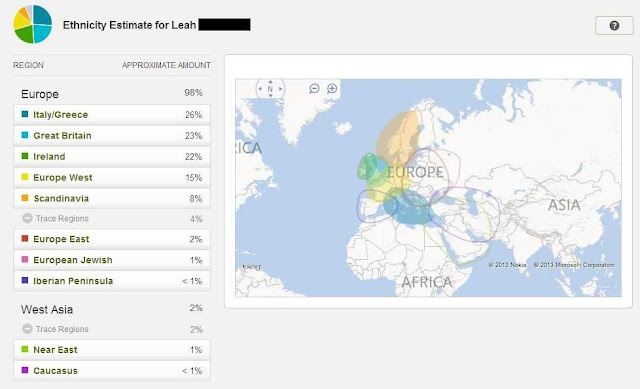 My mother's 23andMe results are now in and within a few hours of discovering her Relative Finder results, I had established a connection. I found a 7th cousin, once removed through my Hudson line so it isn't a big deal discovery, although it does serve as some confirmation of my connection to our shared ancestors. I was surprised to establish a match so quickly because in the week since my father's Relative Finder matches were released, I haven't gotten very far. In fact the only match of his I did find, I discovered off of 23andMe. As for my mother's mtDNA, she is K1a4a1. I knew from the FamilyTreeDNA test I took in November that she would be in K but it is nice to discover our sub-clade. I don't know much about K1a4a1 but I still believe my line was Irish and I haven't seen any information on K1a4a1 that disprove this. Now that both sets of results are done, I plan on concentrating on 1) educating myself on genetic genealogy and my parents' haplogroups especially, 2) establishing connections with possible genetic matches that cross my path and 3) finding ways to use my raw DNA data to further my results and information independently from 23andMe and whatever future company I might to chose to test through. I've already amended my list of questions for new cousins to include: "Have you or a shared relative of ours taken a genetic genealogy test? If so, which company did you/they use?" I'm also adding my FamilyTreeDNA kit number, dna-forums.org member name and a little blurb about my having tested through 23andMe to my e-mail signature as I think having that information there could prove to be a great conversation starter as well as provide information for potential cousins to find me elsewhere. Excellent idea about updating your signature, Leah. I'm going to borrow that one!